The blood–brain barrier (BBB) is a highly complex and dynamic structure, mainly composed of brain microvascular endothelial cells, pericytes, astrocytes and the basement membrane (BM). The vast majority of BBB research focuses on its cellular constituents. Its non-cellular component, the BM, on the other hand, is largely understudied due to its intrinsic complexity and the lack of research tools. In this review, we focus on the role of the BM in BBB integrity. We first briefly introduce the biochemical composition and structure of the BM. Next, the biological functions of major components of the BM in BBB formation and maintenance are discussed. Our goal is to provide a concise overview on how the BM contributes to BBB integrity. Unlike the cellular constituents of the BBB, the BM is largely understudied probably due to its intrinsic complexity. Recent studies suggest that the BM also contributes substantially to vascular barrier function.22–25 In this review, we summarise recent findings on the function of the BM in BBB integrity. First, we briefly introduce the biochemical composition and structure of the BM. Next, we discuss the function of each major component of the BM in BBB formation and maintenance. 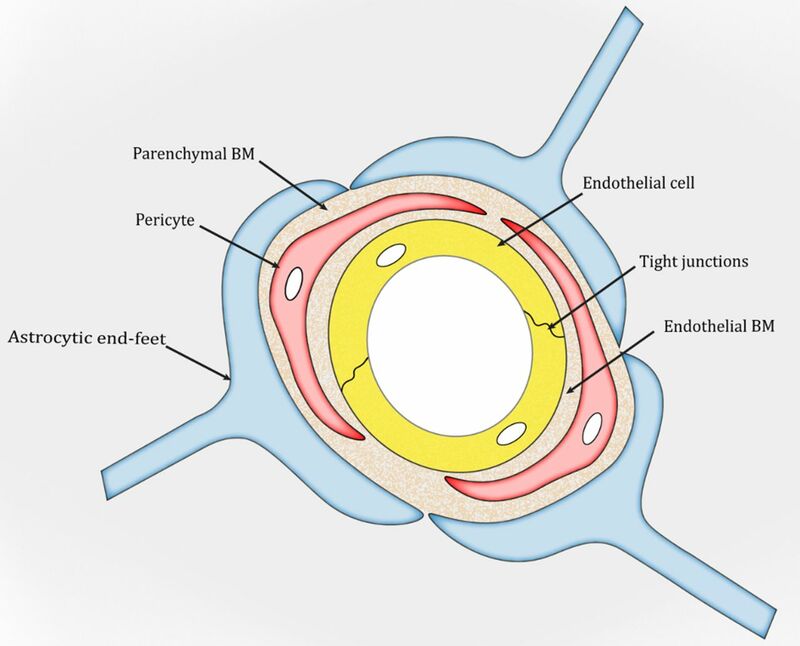 The BM is a unique form of the extracellular matrix (ECM) found predominantly underneath endothelial and epithelial cells. It exerts many important functions, including structural support, cell anchoring and signalling transduction.26–28 In the brain, two types of BM are found: an endothelial BM and a parenchymal BM (figure 1), which are separated by pericytes.29–31 Under physiological conditions, the two BM layers are indistinguishable and look like one in areas without pericytes (figure 1). Structurally, the BM is a highly organised protein sheet with a thickness of 50–100 nm.32–34 Biochemically, the BM consists of four major ECM proteins: collagen IV, laminin, nidogen and perlecan. These ECM proteins are synthesised predominantly by BMECs, pericytes and astrocytes at the BBB. The functional significance of each BM component in BBB integrity is discussed below. Schematic illustration of the blood–brain barrier. BM, basement membrane. Collagen IV, the most abundant component of the BM, is a trimeric protein containing three α-chains. Currently, six collagen IV α-chains (COL4A1–6) have been identified.35–37 Unlike COL4A3–6, which are more spatially and temporally restricted, COL4A1 and COL4A2 are present in almost all BMs and are highly conserved across species.38 It has been shown that ablation of COL4A1/2 results in abnormal BM structure and embryonic lethality at E10.5–E11.5, although BM formation during early development is unaffected,39 suggesting that collagen IV is required for the maintenance but not formation of the BM. In addition, mice with splice mutation lacking exon 41 of COL4A1 in both alleles die during embryogenesis, whereas those with such mutation in one allele show cerebrovascular defects, including porencephaly and intracerebral haemorrhage.40–42 To examine the relative contribution of each cell type at the BBB, exon 41 of COL4A1 was ablated in BMECs, pericytes and astrocytes, respectively. Although loss of exon 41 of COL4A1 in astrocytes caused very mild intracerebral haemorrhage, such mutation in BMECs or pericytes resulted in fully penetrant intracerebral haemorrhage and incompletely penetrant porencephaly.42 These results suggest that loss of exon 41 of COL4A1 in both BMECs and pericytes contributes to cerebrovascular defects. Consistent with these reports, various missense mutations in COL4A1/2 lead to brain malformation and intracerebral haemorrhage with different severity.43–45 Together, these results suggest a crucial role of collagen IV in vascular integrity. The major findings in these studies have been summarised in table 1. Laminin is a T-shaped or cruciform-shaped trimeric protein composed of α, β and γ chains. So far, five α, four β and three γ chains have been identified.46 47 Various combinations of these subunits generate a large number of laminin isoforms. Although BMECs, pericytes and astrocytes all make laminin at the BBB, they synthesise different laminin isoforms. For example, BMECs generate laminin-α4β1γ1 (-411) and laminin-511,29 48 astrocytes predominately make laminin-211,29 49 whereas pericytes mainly synthesise laminins containing α4, α5 and γ1.50 51 Due to this cell-specific expression pattern, laminin shows differential distribution between endothelial and parenchymal BMs.30 Specifically, astrocyte-derived laminin-211 is predominantly found in parenchymal BM, whereas endothelial cell–derived laminin-411 and laminin-511 are mainly located in endothelial BM. To investigate laminin’s function in BBB integrity, a variety of laminin loss-of-function mutants have been generated. Global knockout of most laminin subunits, including α5,52–54 β155 or γ1,55–57 leads to embryonic lethality, preventing investigation of their functions in BBB integrity. To overcome this limitation and enable investigation of laminin’s function in a cell-specific manner, we generated a series of conditional knockout lines targeting the laminin γ1 chain, a common subunit found in almost all laminin isoforms at the BBB. In a previous study, we showed that loss of astrocyte-derived laminin (laminin-211) led to age-dependent BBB breakdown and intracerebral haemorrhage.1 Consistent with our finding, laminin α2 null mutants displayed postnatal BBB disruption.58 These results suggest an indispensable role of astrocytic laminin in BBB maintenance. In addition, we also generated transgenic mice with laminin deficiency in vascular smooth muscle cells (vSMCs, termed SKO hereafter)51 59 and mural cells (vSMCs and pericytes, termed PKO hereafter).51 60 In a mixed genetic background, the PKO mice demonstrated BBB breakdown and hydrocephalus, and usually died within 4 months.51 None of these deficits were observed in SKO mice,51 suggesting that it is the loss of pericyte-derived rather than vSMC-derived laminin that causes these changes. Given that hydrocephalus itself can cause BBB compromise, it remains unclear whether BBB disruption in PKO mice is due to loss of pericytic laminin or secondary to hydrocephalus. Based on that hydrocephalus is highly genetic background dependent,61–67 we hypothesise that we can eliminate or reduce hydrocephalus by crossing the PKO mice into different backgrounds. We are currently testing this hypothesis in our laboratory. Unlike laminin α5 global knockout mice, laminin α4 null mutants are viable.68 They show compromised vascular integrity and haemorrhage at perinatal stage but not in adulthood.68 Since laminin α5 expression in the vasculature starts after birth,48 69 it is believed that loss of laminin α4 is compensated by laminin α5, which rescues the haemorrhagic phenotype in adulthood. Recently, mice with laminin α5 deficiency in endothelial cells were generated.70 71 These mutants fail to display any obvious defects under homeostatic conditions,70 71 again suggesting potential compensation between laminin α4 and α5. Due to this mutual compensation, the role of endothelial laminin in BBB integrity remains largely unknown. These loss-of-function studies are summarised in table 1. Nidogen, also known as entactin, functions to stabilise the collagen IV and laminin networks. Two nidogen isoforms (nidogen-1 and nidogen-2) have been identified in mammals.72 Interestingly, mice deficient for nidogen-1 or nidogen-2 are grossly normal, except that a mild alteration in brain capillary BM is observed in nidogen-1 mutants.72–74 In addition, although nidogen-1 expression is unchanged in nidogen-2 null mice,75 redistribution and upregulation of nidogen-2 have been observed in nidogen-1 null mice.76 These results indicate the existence of compensatory mechanism between nidogen-1 and nidogen-2. Consistent with this speculation, deletion of both nidogen-1 and nidogen-2 leads to severe BM defects and perinatal lethality.77–79 It remains unclear how nidogens contribute to BBB integrity. Perlecan, also known as heparan sulfate proteoglycan 2 (HSPG2), is an extremely large protein present in most BMs.80 It has various domains (I–V) and motifs, which enable them to interact with a large number of molecules,81–83 such as ECM proteins and heparin-binding growth factors. Loss-of-function studies demonstrated that perlecan-deficient mice died at E10–E12. In addition, many complex phenotypes in multiple tissues/organs were found in these mutants, although BM formation was not affected.84–86 These results suggest that perlecan is dispensable for BM formation but required for embryogenesis. Due to this early embryonic lethality, the function of perlecan in BBB integrity remains unknown. The BBB plays essential roles in brain homeostasis under physiological conditions and disease pathogenesis/progression under pathological conditions. Recent studies strongly suggest that the BM also actively participates in BBB regulation. However, how exactly the BM regulates BBB integrity at the molecular and cellular levels is largely unknown due to its intrinsic complexity and the lack of research tools. With the advancement in genetics and biochemistry, we are starting to answer this important question. This knowledge will widen/deepen our understanding of BBB regulation and promote the development of innovative therapies for neurological disorders with BBB disruption.
. Type IV collagen: structure, gene organization, and role in human diseases. Molecular basis of Goodpasture and Alport syndromes and diffuse leiomyomatosis. J Biol Chem 1993;268:26033–6.
. Defects in mesoderm, neural tube and vascular development in mouse embryos lacking fibronectin. Development 1993;119:1079–91. Contributors LX and AN did the literature search. All authors wrote the manuscript. YY edited the manuscript. Funding This work was partially supported by the American Heart Association Scientist Development Grant (16SDG29320001).